God has made us a little less than Himself, to be His stewards on this Earth! Wow! We really don't behave to that standard very often, do we? In fact, sometimes, some of us act less nobly than the most base beasts. It really behoves us to reach out for God's help to live up to this standard. Hymn TIS 142 "Glory be to God the Father" All praise to God. Not even a little bit to us. It's very tempting to think any success must be, at least partly, because of our talent or hard work but everything flows from the Lord of Light. Helen began by asking the congregation to consider their gifts and then went on to say that the Church believes we have been given these gifts to build God's Church by serving others. Helen then introduced the two newly elected elders and proceeded with the commissioning by asking the two to make certain vows. Do you confess anew Jesus Christ as Lord? Do you believe you are called by God through The Church to this ministry? Do you adhere to the Basis of Union! Relying on God's grace do you promise to carry out the duties of your office? I do. Will you, the members of Marsden Road Uniting Church, accept Joan and Mae as elders? serving with them the one Lord Jesus Christ? We will. May God give you the strength to fulfill these vows; and to him be the glory in the Church and in Christ Jesus from generation to generation for ever. Amen. Act of Commissioning Those elders and appointed people to join with the minister in the laying on of hands, come forward. Prayers were offered by these people giving form to the support offered pledged by the congregation. Hands are laid on the head of each candidate. Helen says: Joan receive the Holy Spirit for the ministry of elder. Amen. Mae receive the Holy Spirit for the ministry of elder. Amen. and be gracious unto; the Lord lift up his countenance upon you, and give you peace. Declaration In the name of our Lord Jesus Christ, I declare you elders of the Uniting Church in Australia, in the Marsden Road Congregation. Helen went on to say that, having different gifts, and being at different stages in life and dependent on our different situations in life, we may understand God differently. Perhaps each of us understand a different facet of God's glory and are able to minister differently because of that. 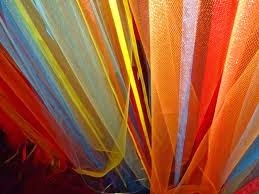 Hymn TIS 182 "Bring many names" A hymn to the many forms God takes in our lives, serving our many and various needs: attending to each of us as though we were the only person on the planet. A big ask. But God is great. The only one sufficient to the task. Prayer of Praise and Confession A prayer, thanking God for the many ways creation reveals the glory of the One beyond anything we can imagine. "Forgive us for filling our lives with events and activities that block you out. For lacking confidence in your presence as we face life's challenges." Words of Assurance "It is God who forgives and holds us. "Your sins are forgiven". Thanks be to God. Scripture Reading Alan read to us from John 16: 12 - 15. Jesus was explaining to His disciples that there was more to be told but that it would need to wait until the coming of the Spirit, who would guide them (and us) in all things. 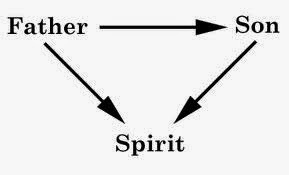 Jesus went on to say that the Spirit would glorify Him and that the Father and Him (Jesus) were one. A thumbnail sketch of The Trinity. Reflection Helen pointed out that the word "Trinity" does not appear in the Bible but the concept does, (as it did in the reading). The idea of the Father, Son and Holy Spirit, as the Trinity, is one we can't just seem to get our head around, so we look for different ways of thinking about it and expressing it. Helen then made the point that the way we see the Trinity is the way we see God and informs the way we approach God. The first model offered was that of a triangle, with the Father at the top and Jesus and the Holy Spirit on each corner of the base. Helen described this as the "Business Model" with God as the "boss", the "head". The next model suggested was that of a straight line, a little like the layout of some churches, especially the Orthodox churches with the sacred space at the front, signifying the Father, with the Communion Rail, symbolizing the position of Jesus through to the Holy Spirit near the back of the church. Helen confessed she found this model unhelpful, although she knew it suited some people, because it makes the Father farther away - not so much a personal God. interchangeable, depends on the focus of the particular denomination. Traditional churches place the Father at the top, while Evangelicals put Jesus at the top and the charismatic, the Holy Spirit. However the model Helen preferred is the circle with Father, Son and Holy Spirit on the circumference and us in the middle, so when we pray we pray from within the circle, we don't have to search for God. We are praying in God and God is in us. We are becoming one with God. We can be assured that that's how close God is. Poem Helen then read a poem, "Without You" by Thom M. Shuman. Space does not allow its inclusion here, but it is well worth following up. Hymn: "Maker of All Things" by Elizabeth J. Smith from "Songs for a Hopeful Church" much the same sentiments as the poem. God meeting our every need. Giving our life meaning, keeping us close. Hymn TIS 179 "Praise with Joy the World's Creator" Not "A Man for all Seasons" but "A God for all Seasons". God is our all! God provides all! God knows all! Commissioning: God loves relationship. It is in relationship that we know God and in relationship God knows us. We draw closer to God as we draw closer to each other and the closer we get to each other, the more we know God. This is our journey. Blessing TIS 779 "May the Feet of God walk with You"
The Call to Worship, where Margaret led a responsive reading of an adaptation of a poem by Frances Hawkley, called Walking with the Holy Spirit, which spoke of our walk with the Spirit of God, with that Spirit acting as our guide and counsellor and the freedom and passion accompanying such a journey. Hymn TIS 716 "Father we Adore You" An affirmation of our devotion to God as He meets our every need. Prayer of Invocation (written by Rev. Abi) This was led by Elaine and followed the Call to Worship as a responsive prayer asking for the Holy Spirit to act upon us as it did upon the disciples, so long ago. Hymn TIS 675 " Shine Jesus Shine" asking for the Light of Jesus to blaze through us, showing His love to the world in which there is so much darkness. Asking that our faces will show His radiance and our lives His love. Prayer of Confession acknowledging God's Spirit as the spark that lights the flame of God's empowerment within us and confessing that we don't always call on that Spirit as we should. Words of Assurance God is present by the Spirit in the world. God is here. We are here. We are loved and we are forgiven. Hymn TIS 187 "Let all Creation Dance" The work of God's spirit in us does not create burdens; the Spirit energises us and brings joy. Prayer of Thanksgiving Thanks to God for His sprightly spirit amongst us, revealing the new possibilities brought about by the spontaneity of the Creator. Thanks to God for cleansing us and for being the vital alternative to a purposeless world. Firstly, Jesus teaches His disciples that if they have seen Him they have seen the Father, and that as His followers, who follow His commandments, they will do greater works than He because they will be sent an Advocate, who will abide in them. In the Acts reading there is the familiar story of the Holy Spirit settling on the disciples, changing them forever. Reflection- "The Beginning of Something New". 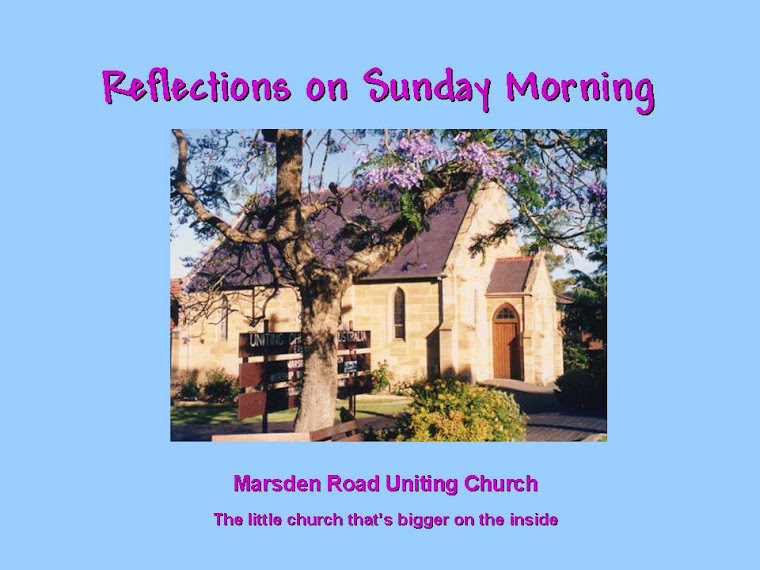 Margaret delivered this reflection, which is why there are no comments or asides in today's blog. Writing the Reflection and taking part in Elaine's liturgy was enough! Today we were looking at Pentecost as a celebration and what we have and can have to celebrate. Along the way we thought about those bits and pieces of our lives not yet surrendered to the Spirit's guidance and how, if we ask the Spirit to enter our lives, even our committed lives, and take control of previously guarded aspects, we can be mended, approaching day by day, what we are intended to be. But, looking at the events on the Day of Pentecost, we could see that this wouldn't just be a band-aid job. The Holy Spirit, as comforter, counsellor, advocate, and teacher can meet our every need and as such, is able to transform us, turning us into the Spirit's agents in this world. The offering was collected and offered to God's work in the community, to further His kingdom. AND FREELY ACCEPT AND EMBRACE OTHERS. After this Elaine prayed for the concerns of the congregation, following with the Lord's Prayer. Hymn TIS 105 "Let all the World" An anthem to God's greatness which can reach to all corners of the Earth and which no barriers can resist. Kindle in our hearts the fire of your love. Amen. all are understood and all are loved. We were welcomed and the notices given. Helen suggested that for the following Sunday, Pentecost Sunday, members of the congregation might wear red, the colour of celebration. God is God and God loves us"
Hymn TIS 133 "O worship the King, all glorious above" By the time we had sung this, there was nothing left to say, so why do we think God is not to be trusted with the tiller of our lives. Why do we keep such a strong grip on things? Precious Memories by Richard Lyon Morgan. Taken from a prayer called "Fire in the Soul", these thoughts were about our memories and how we benefit from this store of the good things that have happened in our life. They also questioned the worth of the speedy and brief communications of today, asking whether relationships can grow from these. Hymn MP 936 (Kendrick and Steve Thompson, 1993, Make Way) A hymn, a prayer, asking to learn to do things God's way. In His style, to His rhythms, with His enlightenment, with His power, in His strength. In obedience. Seems like a formula for success. Call to Confession "God's love is steadfast, and God's faithfulness endures from age to age. Our love falters, and our faithfulness waxes and wanes from day to day. Let us confess our sin and our need for God." Prayer of Confession Helen prayed for us, thanking God for bringing us life through His love: confessing our need for God's power; confessing our lack of judgement; confessing that we live lives that do not lead to peace. She then prayed: "Forgive us"
Words of Assurance Yours sins are forgiven. Thanks be to God. Scripture Reading John 17: 20 - 26 A prayer by Jesus that we, who have been given to Him, will be one with each other and together, be in Him. That seems to imply that we shouldn't be flogging our own agenda but looking after each other in the way that Jesus would and making our plans together according to the way He has directed. In turn, that would imply that we should pray for direction and wait upon God's voice. Reflection Helen began by drawing our attention to the gradual development, through historical time, of our concept of Jesus. Firstly she pointed out that the Synoptic gospels directed us to Jesus the Lamb who died. As those gospels unfolded, the realization dawned that the man was the Son of God. But not John. 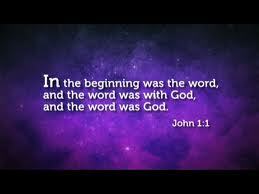 "In the beginning was the Word and the Word was with God and the Word was God" and later: "And the Word became flesh and lived among us". For the first 100 years of Christianity, Jesus was divine and the struggle was with how He could be human at the same time. This struggle threatened the existence of the church, so the Council of Chalcedon was convened in AD 451 to settle the matter. Various groups proposed different concepts of Jesus but they were all rejected, with the decision that Jesus was and is fully divine and fully human. But does it really matter? Helen went on to show how it did. In the reading, Jesus prays, "As you Father, are in me and I am in you, may they also be in us." Jesus was praying for His disciples and us, here in 2013. This means that, since Jesus is God and Jesus is In me, I have direct access to God. That applies to each one of us and therefore, we are united by God within. Helen then spoke of how this had made a difference in the last 18 months of her life where she had run into a brick wall, with no way over, under or around it. The consequences of not being able to find a way through were too dark to think about. So she dug deep - where she found God. God who has suffered and hears and understands ours cries. It is that God onto whom we have to cling, waiting for a miracle to unfold. Waiting for a new life, a new beginning. Peace within. Together: "Jesus, name above all names, beautiful Saviour, glorious Lord; Emmanuel, God is with us, blessed Redeemer, living Word." Prayer "Lord Jesus, show us the Father, reveal to us the ways of God. We have experienced you as 'God with us,' the full revelation of God, God radiantly with us, God too close for comfort." Freewill Offering "Lord, everything we have comes from you...May it be that these gifts that have sustained and enriched us now sustain and enrich others. Amen"
Time for quiet Reflection God help us, we can be so hopeless! Let your voice soak into our heads so that we cannot escape its intent because sometimes we are no better than little children. Prayer for Others and The Lord's Prayer Helen began by drawing our attention to the "Headlines" of the past weeks, which were, for all of us, a source of "How could such a thing happen?". Kidnappings; a bomb blowing off most of a boy's hands; bleach thrown by ADULT women; 1000 dead from clothing factory collapse - have we bought these clothes cheaply? A couple missing from a cruise ship; kids not able to study because of lack of sleep; drought; scandals concerning collusion between church and police. The list went on and was added to by similar concerns of the congregation. It seems the world has gone mad. For these and more matters, Helen prayed, and then for the needs of those close to the congregation. Hymn TIS 231 "At the name of Jesus" Every knee shall bow. Every name confess Him. Every heart enthrone Him. Worshipped, trusted, adored. King of Glory now. That would be a different world because it would be a different us. Blessing "This day, may we know ourselves loved and valued. This day, may we notice the beauty around us, in things great and small. This day may we not miss the messages of joy, of peace, and of hope that the Lord sends us." If we take this message on, the world changes. "You shall go out with joy and be led forth in peace, and the mountains and the hills shall break forth in singing. and you'll go out with joy. YES!!! Call to Worship, reminding us of God's love for all His creation, in which he delights and among which He has no favourites because He doesn't just love all, He is love. Hymn TIS 232 "O the deep, deep love of Jesus" Deep, vast, boundless, all around us, everlasting. Our haven - Jesus' mighty love for us. Scripture Reading John 5: 1 - 18. Elaine delivered the story of Jesus visiting the pool, Bethzatha, where there were many invalids, waiting to be healed by being lowered into the water when it started to stir. Jesus approached one man, and after questioning him, told him to, "Stand up, take up your mat and walk" and the man did just that. However it was the Sabbath, so the Jews became angry with Jesus, and began to seek Him out to kill him. Two thoughts occur to me: the importance we can place on certain things and the priorities by which we can order a range of things, is sometimes more in keeping with what makes us feel safe rather than with what God would intend. Secondly, perhaps we hobble along spiritually, because we don't fully believe we will make it when we get the command to stand up and walk (in the spiritual sense). Maybe it's safer for us to remain crippled, because, in that state, we get ask to be served, not serve. Reflection "Undeserved Grace" Helen directed our attention to the first words of the Gospel of John: "In the beginning was the Word, and the Word was with God, and the Word was God." She then went on to say that John spent the rest of the gospel showing how that was so. That is, that Jesus and God are one. The healing by the pool in today's reading, is one of the focusses John uses to prove what was said in the first lines. The Bible says different things to different people at different times. The Holy Spirit uses scripture to teach and guide. But then Helen confessed to getting a bit cranky with this reading. Why would Jesus ask the man if he wanted to be healed? The poor man had been waiting by the pool for decades. But then Helen said she had thought about it again. What is the message to us? It was that sometimes we are happy the way we are - it's safe. Change means uncertainty and for this reason we are not quick to change even when it's clear that it is for our own good. Then the next thing that made Helen cranky was the response of the authorities. Did they rejoice because a cripple was walking? No! All they could think about was that he was healed on the Sabbath, breaking ones of their many, many rules. We do that today. We get bogged down in the trivia of our rules and regulations, instead of rejoicing at a clear sign of God at work. Then to make matters so much worse, those same authorities started to plot to kill Jesus. Hang on. Isn't here a commandment, "Thou shalt not kill" ? Further, Helen didn't like the healed guy much either. When Jesus asked if he wanted to be healed, you would expect a "Yes" or at least a "No" but he starts on with excuses. He doesn't ask who Jesus is, and goes to the Temple and dobs with no record of his even thanking Jesus. The Festival that was happening at the time was a device to remind the Jews of what God had done for them. Which is exactly what this story is for us. It is a picture of God at work. The amazing grace of God, shown in Jesus. Hymn TIS 129 "Amazing Grace (how sweet the sound)". "I once was lost, but now am found," So why do we keep behaving as though we are lost? Prayer for Others and the Lord's Prayer Nerida prayed that, as we from our comfortable lives are unable to comprehend the tragedy and destruction around us, God will support the many aid groups who give help to all without favour, showing His love to the world. She then prayed for our country and our leaders and then for those close to members of the congregation, and also asked that as we shared the bread and wine, that we should be aware of the spirit within. Someone like me A story by John Harvey from Iona. Fire and Bread p247. Helen told this humbling story of three groups spending two weeks at Iona. There was a group of young men who were prisoners from the gaol, a group who suffered from cerebral palsy and another group of teenagers who were under the care of social workers. The weeks were more than successful and culminated in a communion service, which included the Passing of the Peace. After the service, one of the prisoners was found sobbing. It was thought he was dreading the return to prison but that was not it. He was brought undone because he thought that no one in a church would ever want to shake the hand of someone like him. Then Helen exhorted us to pass to each other that friendship and love that prisoner received, as an echo of God's gift of Grace to us. Hymn TIS 655 v1+ chorus Through this hymn we prayed that God "will descend upon (our lives) and make (us) whole"
Prayer of Confession Helen prayed for all of us, asking forgiveness for our lack of care for each other, for our unpleasantness, for our focus on ourselves and our blindness to the God who lives and transforms. Words of Assurance We were directed to focus on the communion elements. The Blood of Christ, poured out for you. Whatever we are like-however pathetic our behaviour. We are loved and cherished. Hymn TIS 655 v2 + chorus With this assurance, we acted out our belief and sang with conviction, "O come and sing this song with gladness." Communion we recalled the actions of Jesus and the events during the Last Supper and then prayed, asking God's blessing on the elements, that we would be reminded of God's grace. We asked for each of us to receive God's Spirit and be challenged by God's presence. Of course, we can look away and make excuses but that would be missing a great opportunity. 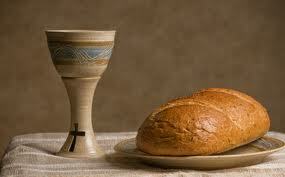 Prayer after Communion "We are children and people of God. We give thanks that he is good and God's love is now and forever. Hymn TIS 531 "Sent forth by God's blessing" "His grace shall invite us, his love shall unite us"- that will only happen when we keep our focus on Him. As soon as we revert to putting ourselves first, it follows that we will lose direction. Living our lives in God's love. It really doesn't work very well any other way.